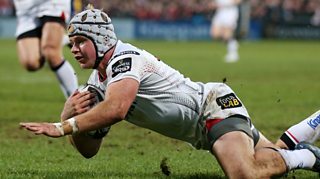 Ulster move into a play-off spot in the Pro12 with five sets of games left after a thumping 10-try win over bottom club Zebre at Kingspan Stadium. Luke Marshall and Charles Piutau helped themselves to two tries each, but there was concern about a potential knee injury to Marcell Coetzee. Ruan Pienaar, Jacob Stockdale, Craig Gilroy, John Andrew, Stuart Olding and Paul Marshall also notched tries as Ulster ran the Italians ragged.